Keeping your living room entertainment area safe. Every home has a TV, and unfortunately, they’re like magnets for the curious toddler. And flatscreen televisions are even more dangerous than the big, bulky ones we had when we were kids. Try knocking one of those over! 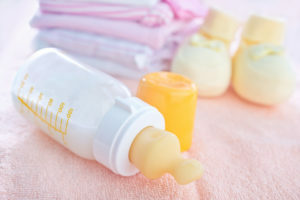 According to the Consumer Product Safety Commission (CPSC), every 24 minutes a child is sent to the emergency room due to injuries from a falling television or furniture. Between the years 2000 and 2013, 430 children were killed in these accidents. These are shocking statistics, and prove how important it is to make sure our televisions are properly baby proofed and secured. TV Straps: The simplest (and cheapest) method. You can buy TV straps that you use to secure the television to either the wall or the stand, and they’re pretty cheap and simple to use. As you can see from the picture, they attach to the back of the TV, and then you screw it to the wall, securing it in place. They’re simple to install as long as you have a power drill, and should be good enough to give you peace of mind. I recommend the Safety 1st Prograde Flat Screen TV Lock (check it out here). These are a good option if your TV isn’t situated in a location where you can mount it into a stud behind the wall. Of course, it will be stronger that way, but it’s not necessary with these straps. Personally, I’m a huge fan of mounting the television on the wall. Not only does it look neat and saves space, but it keeps it well out of reach of your curious child. In order to mount the TV to the wall properly, you’re going to need at least one wall stud to drill into. If not, it won’t be secured safely. There are probably hundreds of different TV wall mounts available, and most have limits regarding the size and weight of the TV they can use. They also aren’t very expensive, and you should be able to get one for $100 or less. 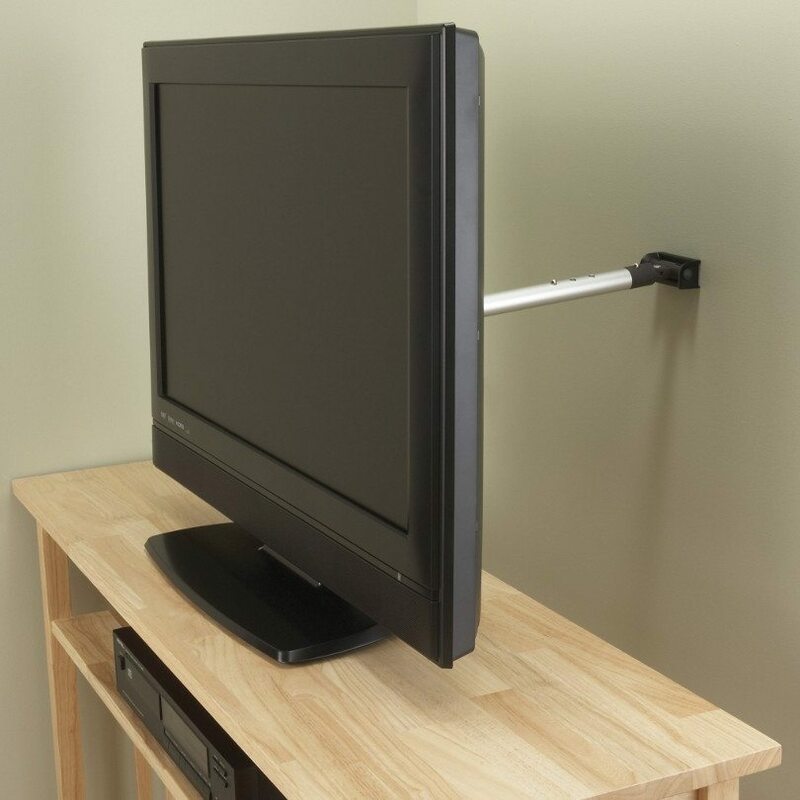 If mounting to the wall isn’t an option, there are also stands that can mount to the TV stand or furniture you have the TV on. 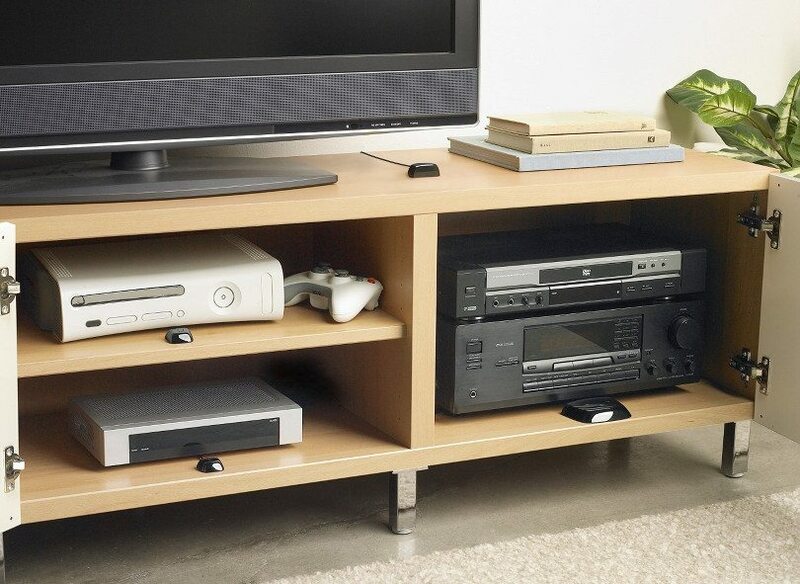 This does require a solid TV stand, because if it’s not solid, it will still just flip over. To be safe, you should probably bolt the furniture to the wall too if you go this route. Something about TV remotes makes them a joy for toddlers to chew on and play with. Maybe it’s because they see us using them, making them want to play with them too. The buttons can be choking hazards. Depending on the quality of the remote, the buttons could come off, or the battery compartment (and then the batteries) could come out with a little poking and prodding. Have you ever thought about how germ-ridden the remote is? I don’t even want to know how much gross bacteria is on it when I use it, let alone when my son has it in his mouth. Baby saliva will ruin your remote. Just trust me on this one. Just make sure to put it away somewhere that they can’t reach it, and don’t know it’s there. 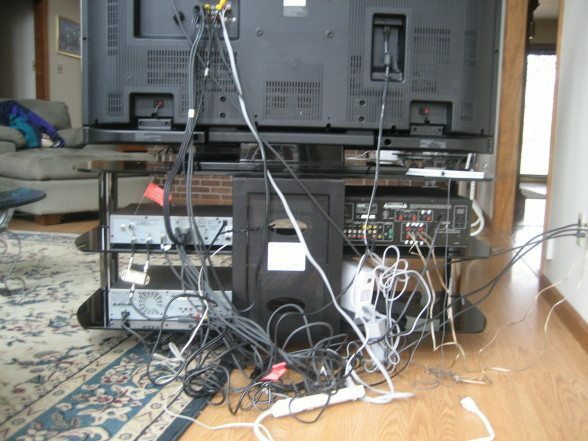 As for wires, you probably want to protect those, too. For the most part, a child pulling out a cable isn’t going to be dangerous, but it sure it annoying when you sit down to watch the latest episode of Project Runway… and nothing happens. Because your little one pulled out the cables that make it work properly, and you have to wait for your husband to come and fix it. Not only that, but chewing on cables is a huge no-no. My recommendation is to put everything together in a cable manager, which you can pick up pretty cheaply. They not only keep things safe, but also it looks so much more tidy and clean. Plus it’s safe! Even worse, it’s possible for them to pull these devices off your media cabinet and on top of them. You’ll need to install a thin layer of plexiglass to the front with velcro. 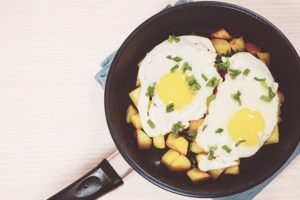 It’s pretty easy and inexpensive to do so! You’ll need a roll of velcro tape (buy it here) and apply it to the edges of the front of the cabinet. Measure the dimensions of the front of your cabinet with a tape measure. If your cabinet doesn’t have an open back, you’ll want to leave a 1/4″ gap on the left and right sides for ventilation. Go to Home Depot (or whichever home hardware store you prefer) and ask them to cut a 1/4″ sheet of plexiglass to the dimensions you measured. If the edges are sharp, sand them down until smooth. Apply the other side of the velcro tape to the edges of the plexiglass. Ta-da! The remotes and game controllers should work perfectly through the plexiglass, and you’ve successfully protected the contents from your toddler. Hopefully you don’t need regular physical access to the contents of the media cabinet, but if you do, it’s not too hard to remove and replace the plexiglass cover.